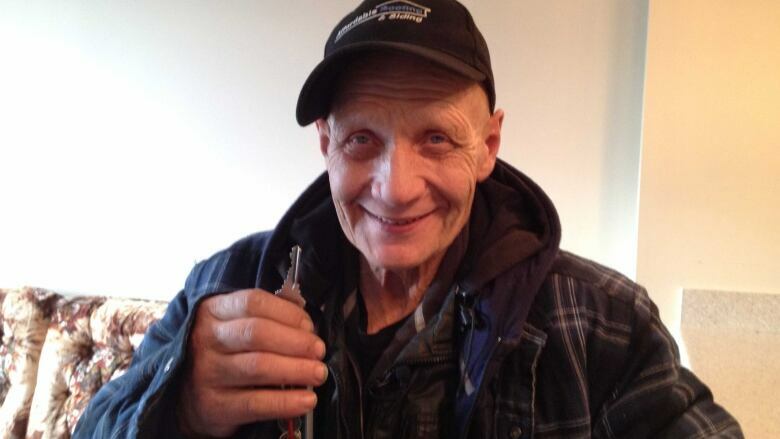 Ken Wilde was living just metres from the noisy highway, burning candles to stay warm. Thanks to Boyle Street Community Services, he moved into a new apartment on Friday. A man who was living in a tent on the side of the Yellowhead Highway will sleep in his own bed tonight for the first time in a year. Ken Wilde was living just metres from the noisy highway, burning candles to stay warm when CBC first met him in October. Thanks to outreach staff at Boyle Street Community Services, Wilde moved into a new apartment on Friday. Wilde’s story shows how easily people can become homeless. After falling from a ladder and breaking his back, Wilde wasn’t able to work and fell behind on his rent. He went through a divorce and his son died. When outreach workers found him, he was homeless and facing a winter outdoors. The housing team at Boyle Street found him an apartment which was furnished with donated furniture, including a single bed – a big deal for someone with a back injury. Outreach worker Aidan Inglis was pleased to see Wilde with a roof over his head. “It’s a tough process because sometimes we’re scrambling to find places at times but we got a whole bunch of people working together to get Ken into a safer place,” he said. Wilde now wants to show his thanks by having all the people who helped him come over to his new place.